Following a month-long application and search process, Mazzoni Center has selected the new Interdisciplinary Review Committee (IRC) for the Philadelphia Trans Wellness Conference. A team of queer and trans staff of color, including the conference logistics team and leaders of trans programming at Mazzoni Center, reviewed applications and conducted interviews with many qualified candidates. The resulting group of trans, nonbinary, and gender nonconforming community members represents a diverse set of ages, identities, experiences, and geographic locations. 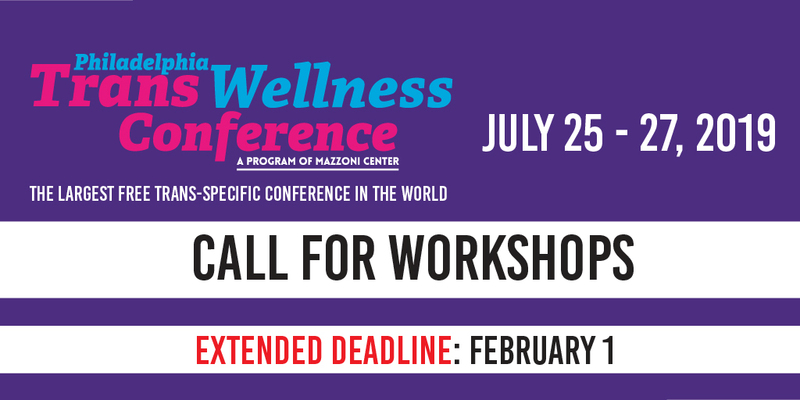 Call for Workshops Deadline Extended. You can count on three things to happen in January: W-2 forms will come in the mail, a snowstorm will hit somewhere, and the Philadelphia Trans Wellness Conference workshop deadline will be extended. Due to the number of requests that we received to extend the workshop submission deadline, we have decided to extend ALL workshop deadlines(General and Professional) until Friday, February 1, 2019. We are pleased to announce it is now accepting entries for the third annual Philadelphia Trans Wellness Conference (PTWC) cover art competition. Planning for PTWC19 is underway and we expect it to be bigger and more exciting than ever!